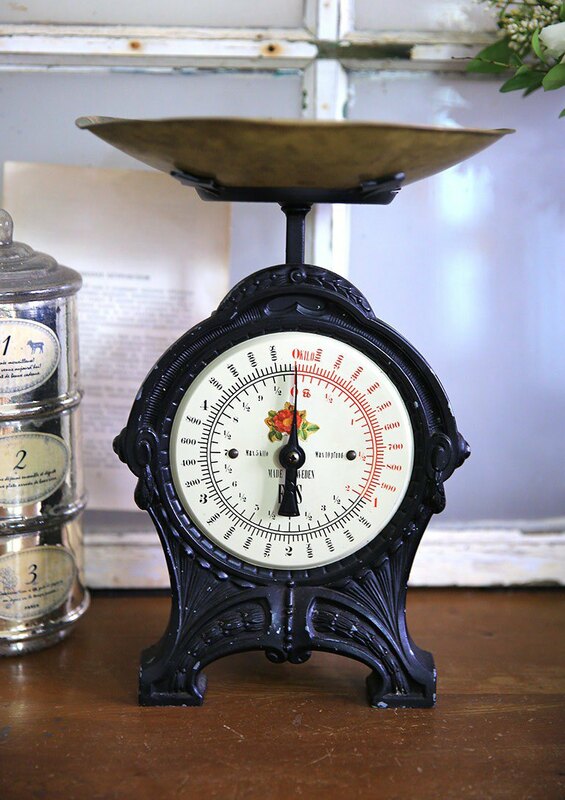 Size: base length 16x width 8 x 30cm with weighing platform, weighing pan about 22.5cm in diameter Material: Middle disk scale is enamel, black is metal, the upper tray is presumed to be copper https://c1.staticflickr.com/1/909/40162546670_09df64d68b_b.jpg https://c1.staticflickr.com/1/826/40162545500_14b1e4a3ca_b.jpg The classic Swedish antique and old scales, the base carving design is very delicate; Saved in good condition, still available (with rotary knob to calibrate) Some yellow enamel scale, Jincheng's disc, heavy base, very beautiful!! Place jewelry, bouquets, etc. Ideal for wedding decoration / ▶ Please note: __▶ The upper weighing pan is skewed with slight dents on the edges. See picture details__ __▶ There are mottled scratches on the top of the weighing pan.__ ▶ Dirt, scratches, wear marks on the middle disc scale __▶ The old scale has obvious small scratches, mottled wear and stain marks. Please read the photo carefully.__ ▶ The weighing function is normal and the weighing accuracy has not been tested ▶ The scene is shot with natural light. The actual items will be slightly darker. Please understand and then place orders. ▶ All the above are normal marks. Please read the whole photo carefully. / Because Taiwan’s climate is relatively humid, Recommended for metal type antiques, regular oil maintenance :) https://c1.staticflickr.com/1/826/40162546540_dce820a6f0_b.jpg https://c1.staticflickr.com/1/908/40162545910_7f13c1baa4_b.jpg https://c1.staticflickr.com/1/961/27100733647_7d2523860b_b.jpg https://c1.staticflickr.com/1/975/40162545990_0ea1a0f7a5_b.jpg https://c1.staticflickr.com/1/955/40162546210_3bcb2b9ab5_b.jpg https://c1.staticflickr.com/1/975/41969422521_00ac93e3cc_b.jpg https://c1.staticflickr.com/1/824/40162545690_2f39af5e64_b.jpg https://c1.staticflickr.com/1/826/41969422271_bccd8d6ac9_b.jpg ============[Before purchasing] ============ Every old antique is our own hard work from home and abroad. The charm of antiques and old things is stacked in time. The beautiful nicks left by the vicissitudes of a hundred years. These are the characteristics of old things. Please do not look at the "new product" standard. Because old antiques are not new and fragile, Therefore, we forgive that we cannot provide a return service. Buyers chasing perfect new products are advised to consider carefully before purchasing.